It's bad etiquette to show up empty handed, if you're attending a festive gathering or any occasion at someone's home. These are are selection gifts which would be appropriate for the host or hostess. Edible presents are always fun and appropriate as are home or entertaining related items. Flowers or a bottle of wine are standard but I wanted to include a mix of tasteful items that would be lovely as well as practical and memorable to show your hosts how much you appreciated their efforts. A fun gift for game lovers, these gorgeously package dipsticks can be played around the dinner table or afterwards. Earl Grey tea has many wonderful health benefits. This classic blend includes the finest quality organic full-leaf Ceylon black tea scented with natural Sicilian bergamot. Blue cornflowers accent the rich black leaves. There's olive oil and then there's this award winning, certified organic extra virgin olive oil that is nitrogen sealed in stainless steel bottles to preserve the oil’s freshness and quality. Each specially designed bottle is signed and numbered. This decadent superfood spread which combines raw, sustainably sourced honey with organic Ecuadorean cacao sounds like it could be a healthier alternative to nutella. Elevate your favorite spice lover's game with this gourmet hot sauce made with an intricate blend of ripe red chili peppers, real black truffle, organic agave nectar and savory spices. Featuring crisp citrus peel notes fortified with rich floral elements, these drops work to effectively neutralize unpleasant odors. Certainly a most sophisticated way to deal with such matters. Regular candle users know that trimming your candle wick prolongs the burn time on your candles and this sleek trimmer makes the task looks stylish while easily scooping up the wick so it can be discarded without any mess. Crafted for all skin types with a time tested, 300-year-old recipe that incorporates the highest quality food grade organic oils, this hand soap is safe and sustainable and every bottle helps to support a school in Tigray, Ethiopia, with a $1 donation to fund water, sanitation and hygiene initiatives. When not in use, this artful looking spice grinder will make a great looking addition to any kitchen countertop or exposed shelf. Form meets function in this elegant piece that holds strike-anywhere matches that can be lit on the surface of base's rough glass etchings. I want this for myself as well. A perfect gift for tea lovers, this innovative tea strainer slides open to function as a spoon, scooping up loose-leaf tea with less mess. Featuring a blocked design that resembles stone, marble, and wood, this serving tray is actually made of durable melamine, a virtually shatterproof material that's suitable for indoor and outdoor use and dishwasher safe. Go beyond flowers with the gift of a live plant with beautiful flowers. This chic hand carved vase with a modern checkerboard pattern is perfectly balanced combination of graphic interest and simple sophistication. This scent diffuser in the shape of a a cactus flowerpot is super cute and sure to delight. This colorful and graphic throw pillow would make a stylish addition to any home. I'd definitely love to get a good bottle of olive oil as a hostess gift! Thanks for sharing all these fantastic idea! I think especially the candle wick trimmer is the perfect gift! In our culture it is considered really rude to show up empty handed even if you're just stopping by to say hi. One should always bring at least a box of chocolates or something of the sort. 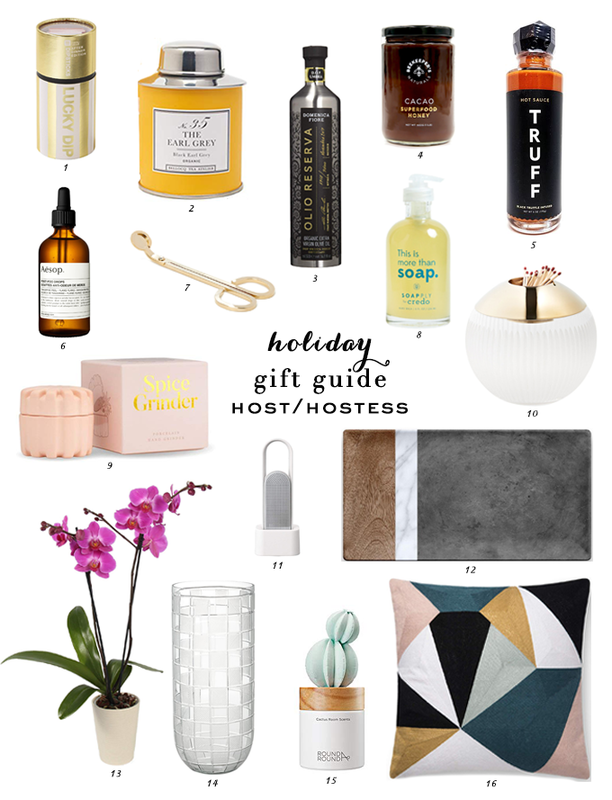 This is a great gift guide for hosts, simply perfect for this holiday season. If someone bothered to cook for us and is ready to entertain us, the least we can do is pick a nice present present. 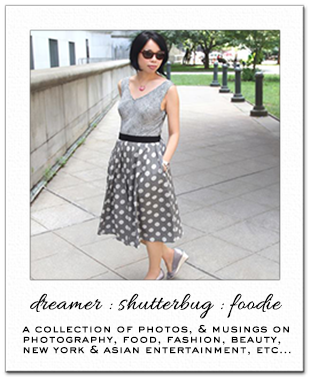 Such an interesting guide Rowena, a lot of lovely products! I love that these gifts are so unique! The candle wick trimmer and cactus diffuser are definitely my favorites! Thanks for sharing these great ideas! These are lovely suggestions. Giving a hostess gift is something that I always struggle with, at least when I try to find something other than wine. Great holidays gift idea thanks. You have such great tastes when it comes to products Rowena! I kinda want everything here for myself, haha! I actually have the Round & round cactus diffuser and it's adorable! The scent is very generic though, it still smells good nonetheless!